Put Down the Table Salt! Salt is salt, isn’t it? It always consists of almost one hundred percent sodium chloride—so why are there so many different types on the market and what’s the difference between them? Table salt is the most common fine cooking salt that probably every one of us has at home. It’s a boiling salt that is mostly industrially cleaned and refined. Consisting of up to 99.9% sodium chloride, it practically contains no minerals or dietary minerals, though some are sold with iodine or fluoride artificially added. Since our soil and ground water are low in iodine, it makes sense to use an iodine-enriched salt as the basic salt in your kitchen. There is often confusion about why a recipe might call for kosher salt. Kosher salt is coarse-grained salt made from salt crystals. It can be flat or pyramidal in structure, depending on the evaporation process used in its production. Its name is derived from its use in the Jewish koshering process of meat. But what makes it special and beloved by home cooks and chefs alike? Because of its coarse texture, it’s a great salt to use when measuring by hand, since you can pinch it easily and double check that it is distributed evenly, as it dissolves more slowly that fine salt. Kosher salt is a good option whenever a recipe calls for coarse salt. Since it doesn’t dissolve as quickly or perhaps as evenly as table salt, it is often shied away from in baking. When salt crystals are too large and heavy when sea water evaporates, they settle on the sea floor where they are then harvested by a machine or by hand. You’ll find these dried, coarse salt grains sold as natural sea salt in the supermarket. Use it to season grill marinades and roasted vegetables or season cooking water with it. If you’d rather use it as a finer salt, simply transfer it into a spice mill. Chefs love the delicately crisp “salt flowers” because of their texture. They get skimmed off the water surface by hand—mostly in French Bretagne and Portugal. 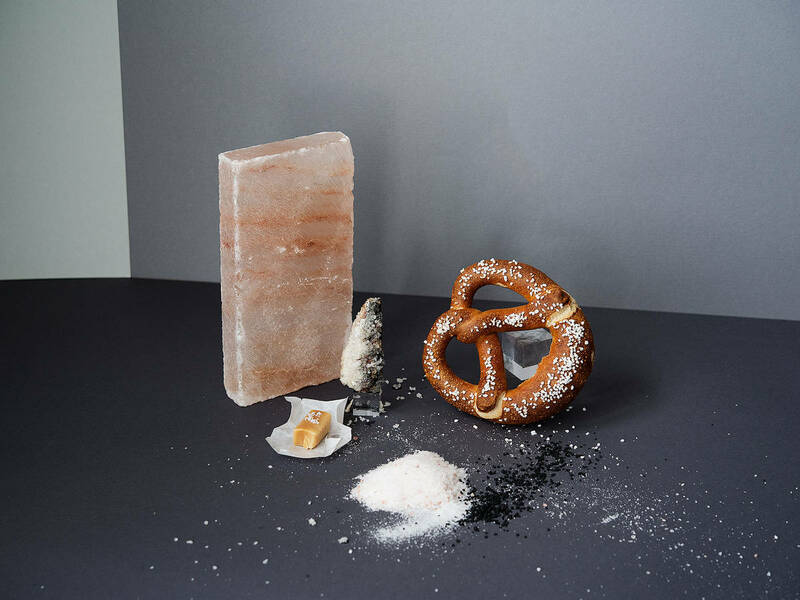 Because of its inherent magnesium content, fleur de sel tastes only mildly salty. This salt is best used for finishing dishes. It also works great in small amounts as a flavor enhancer of sweet desserts, like chocolate mousse, caramel sauces, or atop chocolate chip cookies. Bring color to your plate by using colorful salts like pink Himalayan salt, which gets its color from traces of iron. Fun fact: It actually doesn’t come from the Himalayas but a salt mountain in Pakistan. Or try out Persian blue salt that is rich in potassium chloride, resulting in an intense salty taste. Black Hawaiian salt even tastes a bit nutty and gets its color by activated charcoal, which is supposed to have antioxidant and digestive effects. Use it for grilled vegetables or seafood. Smoked salt is the result of smoking sea salt over wood. Depending on the type of wood that is used, you’ll get different flavors. Invented by the Vikings, it’s not surprising that Danish smoky salt is the most famous. Use it for grilled meat and fish dishes or use it to add a smoky flavor to vegan and vegetarian dishes. Sel gris is a greyish salt produced on the French Atlantic coast. It tastes similar to Fleur de Sel, but is spicier and less salty. It also contains more minerals, traces of algae, and suspended sediments that are responsible for the greyish color. Due to its residual moisture, you shouldn’t use it in a spice mill, but crush it between the fingers or in a mortar. Afterwards, use it for salt crusts for fish or tofu. Which of these salts do you have in your kitchen? Do you have more salt recommendations and tips? Share them in our comments!